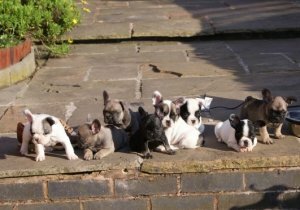 We have 8 registered fawn, white&black French Bulldog puppies for sale and ready to move into forever home. Mum is lovely example of the breed with such a sweet nature. Sire is a pedigree and they are both are dogs and can be seen while viewing puppies. They have got excellent temperaments and get along with our cats, kids, etc. These pups have been brought up within our family home and are very confident and outgoing little characters. They have been regularly wormed to date, flead , vet checked twice and have already had their first vaccinations. puppies will leave registered as well as with a goodies pack each.